Celebrate! 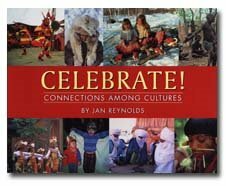 Connections Among Cultures, written and photography by Jan Reynolds, is a gorgeous "picture" book for older children (ages 4-12, I'd say). Celebrate! takes a look at celebrations in eight different cultural groups, including: 1) Tibetans and Sherpas in the Himalaya; 2) the Tuareg, nomads in the Sahara; 3) the Aborigines in Australia; 4) the Sami of "the northern tip of Europe"; 5) the Yanomami of the Amazon basin; 6) the Inuit of the north of North America; 7) the Balinese of Indonesia; 8) people of the United States. The end result, when examining Reynolds' beautiful photographs, celebrates the commonalities of the human experience, while appreciating the colorful differences in each cultural tradition. Reynolds presents many different aspects of traditional celebrations including gathering together, eating and drinking, decorating ourselves, playing music, dancing, and making fires. U.S. celebrations (for making fire, birthday candles are shown as an example) are presented as one of many ways to celebrate as a community group. Celebration! Connections Among Cultures would make an excellent read-aloud for children ages four-eight and a wonderful resource for older children just beginning to explore the world on their own. As I've mentioned, Reynolds' photography is stunning and colorful, perfect for illustrating celebratory events (a photo of a Balinese cake is my personal favorite in the book). The text is straightforward and explanatory, emphasizing commonalities over differences. A beautiful book published by Lee & Low.